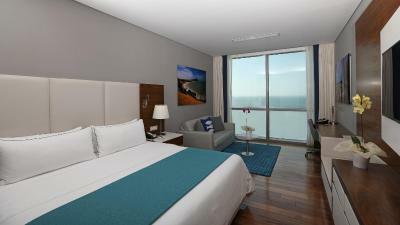 Lock in a great price for Hotel InterContinental Cartagena - rated 8.8 by recent guests. Both the hotel and restaurant staff was friendly and very helpful. Rooms were comfortable and clean. Perfect location for the beach. The staff were very friendly and willing to answer any and all questions. The room itself was very quiet and very clean. The bed was super comfy and it was nice to have the pool and lounge facilities. 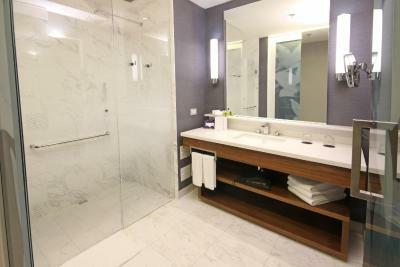 Facilities are great, room is wide and confortable. Stayed in 22 floor and the views are cool. The room was surprisingly large and well laid out with a sofa in the corner which made it feel very comfortable. The Installations were pretty good and spacious. Staff was also above average. I love the swimming pool. It was a bit cold the water and windy up there but it was absolutely fine. The gym has enough equipment and has spectacular view. The staff at the front desk and also concierge were very polite and kind. 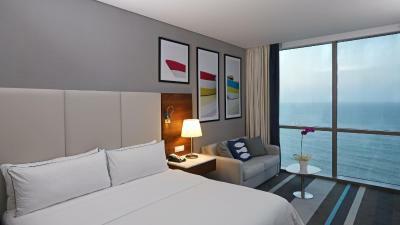 One of our top picks in Cartagena de Indias.The Intercontinental is a luxurious hotel located right on the beach in Cartagena’s popular Bocagrande area. It features an on-site restaurant. 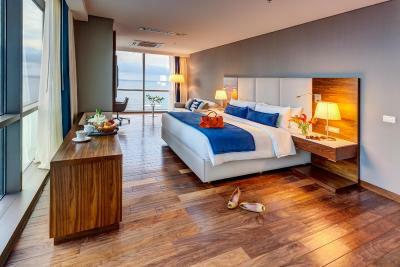 Each spacious, air-conditioned room here boasts elegant décor and comes equipped with a flat-screen TV, a seating area and a minibar. 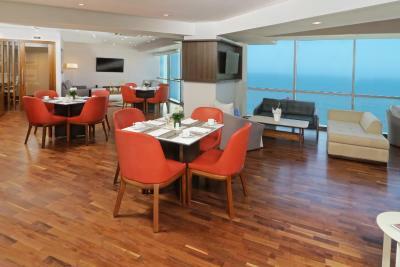 Some feature stunning views of the Caribbean Sea or Cartagena Bay. Guests can enjoy a wide variety of cocktails and beers at the hotel’s spacious roof-top terrace and bar, or explore any of the many restaurants located within less than 200 yards. 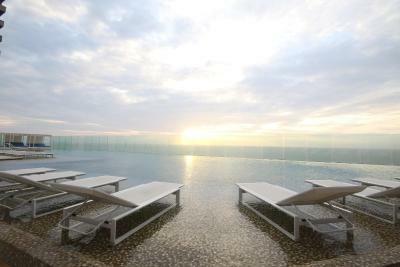 The Intercontinental Cartagena features an outdoor pool. Bocagrande Shopping Centre is only 950 yards away. Cartagena’s famous walled city is within a 10-minute drive of the hotel, while Rafael Núñez International Airport is just 20 minutes away by car. Valet parking service is available at the property. 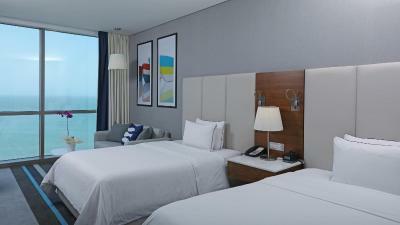 Hotel InterContinental Cartagena has been welcoming Booking.com guests since 20 Aug 2014. 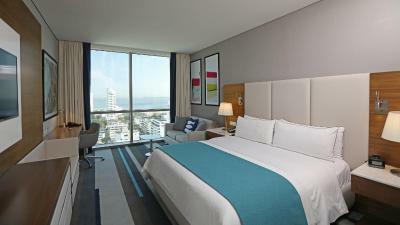 When would you like to stay at Hotel InterContinental Cartagena? 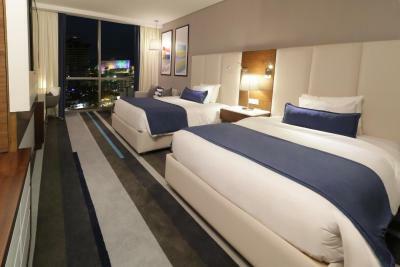 This double room has a cable TV, minibar and air conditioning. Public parking is possible on site (reservation is not possible) and costs USD 2.51 per day. 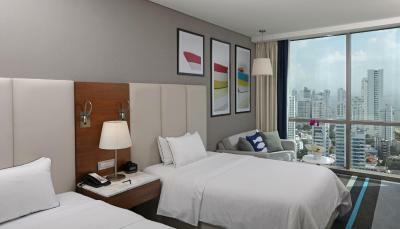 This double room has air conditioning, sofa and minibar. 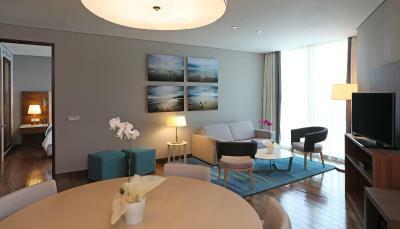 This hotel enjoys a privileged location in Cartagena de Indias. The hotel is located at the heart of the city, providing the ideal base from which to explore the rich culture and history of the area. 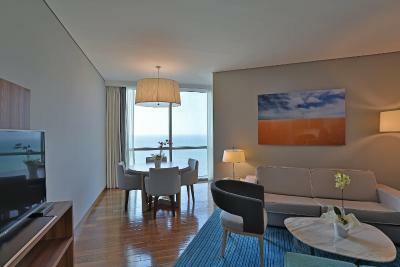 Guests will find themselves just a short walking distance away from the city's main entertainment areas. Casa del Marques de Premio Real, Puerta del Reloj, and San Pedro Claver Church and Convent are located just a short distance away. 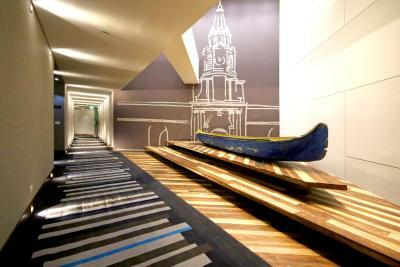 This wonderful hotel enjoys an attractive design. 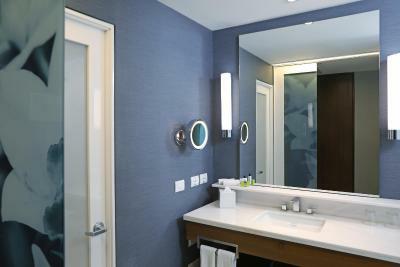 The guest rooms offer a stylish setting in which to work and rest in comfort. The hotel's extensive range of facilities and services ensure that the needs of business and leisure travellers are fully catered for. 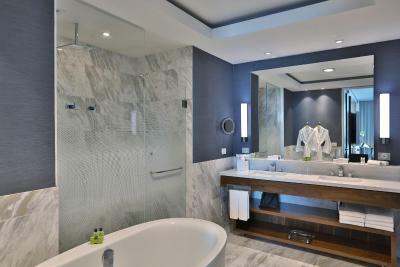 House rules Hotel InterContinental Cartagena takes special requests - add in the next step! Up to two children under 12 years are charged USD 31.33 per night when using existing beds. All further older children or adults are charged USD 31.33 per night for extra beds. Hotel InterContinental Cartagena accepts these cards and reserves the right to temporarily hold an amount prior to arrival. One of the most picturesque neighbourhoods in Cartagena de Indias! Good for Bocagrande but would consider staying in old City in the future. We had an ocean view room, but the windows were very dirty making it less than a view of the ocean. 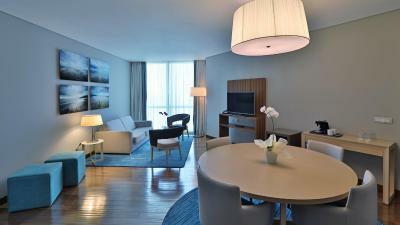 The Intercontinental was well apportioned and staffed with friendly and professional people. We found the facilities to be well maintained and clean. Breakfast buffet was huge and busy at times, but the staff kept it filled. The beach out in front was what I would expect of a resort and nothing more or less, so we enjoyed it every afternoon. Pool is very nice but consistently a little windy and loses the sun for a while in the afternoon. Cab rides to the old town are a little inconvenient but were cheap and was always one waiting at the hotel. Breakfast was below expectations, definitely not matching European standards for hotels of level. Also, facade windows on sea side were quite dirty, thus spoiling the amazing view.